Ferrari 599 hybrid... sort of | What Car? 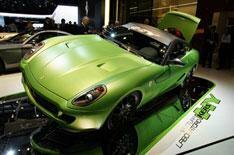 Starring on Ferraris stand is a hybrid version of the 599, but the company is keen to stress that the car is merely a mule to showcase its hybrid technology. 'This is not the new 599 and it does not confirm that the 599 will ever be produced as a hybrid,' a spokesman told us. Instead, the experimental car is the latest example of how the company is trying to further reduce its cars emissions. Following the launch of the California and 457 Italia, the average fuel consumption and emissions of the companys cars have already dropped by 30% since 2007, which was when Ferrari announced a five-year plan to improve economy and reduce emissions across its range. The car on the stand is based on the 599 GTB Fiorano, and the company says it is capable of a 35% reduction in CO2 emissions. That is thanks to its Hy-Kers hybrid drivetrain, which is integrated with the dual-clutch transmission and could be used on any Ferrari, whether front- or rear-engined. the motor assists the engine, but the car can run on electric power alone at low speeds; and, under braking, the otherwise wasted kinetic energy is used to help recharge the batteries. The electric motor itself develops 100bhp, as Ferrari wanted to offset every kilogram of weight the hybrid powertrain adds with at least 1bhp. Key to the development of the hybrid system is Ferraris experience in Formula One. Not only has the control system for the brake regeneration been set up with the benefit of the companys experience of KERS (Kinetic Energy Recovery System), Ferrari has also made sure that all the extra bits and pieces do not adversely affect the cars handling or performance or the interior space. By housing the lithium-ion batteries, electric motor and other associated parts below the cars centre of gravity, the hybrid 599 actually has a lower centre of gravity than the standard model.